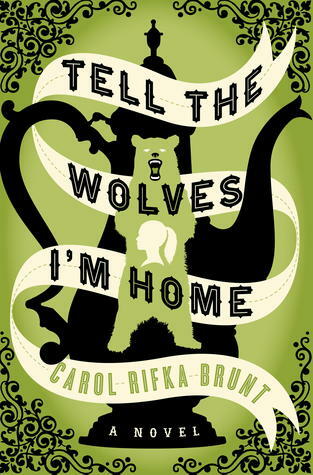 Tell the Wolves I'm Home is in the running for "2012 book read with the best cover." I originally gave this (debatable) honor to The Sisters Brothers, which I think still has a slight edge, but this one is pretty awesome, too, especially after you read the story and look at the cover again and realize all of the meaning that is in there! Tell the Wolves I'm Home is the name of a painting by the reclusive artist Finn Weiss. He painted a portrait of his nieces, Greta and June, in the months before he died of AIDS. June is devastated by his death - Finn had been her best friend, and now that he's gone, she feels bereft. She and Greta used to be best friends, but they've drifted apart in recent years, and their parents are accountants who aren't around much, so June feels more lonely than ever. But then Toby, Finn's longtime boyfriend, enters her life and June is learning so much more about Finn and Toby and her family and herself than she ever knew before. This book is lovely on many levels, but I think my favorite thing about it was the way that Carol Rifka Brunt detailed the highs and lows of a family. My own family is very tight, but we weren't always so close, certainly not while we were in high school, and I think Brunt captures the ups and downs of family relationships perfectly. The way that people can spend so much time together and know so many little things but somehow drift apart due to lack of communication or misunderstandings or any number of things. The way that you can feel so betrayed by someone that it becomes impossible to forget. The complex nature of those relationships, in which you can become so angry and frustrated but still stay utterly loyal. For example, there's this scene where June is at a party and she can't find her sister Greta, but she just knows that Greta would not have left without her, no matter how much they fight and currently dislike each other. So she looks and looks and looks, even as it gets really dark and really cold, and she finally finds Greta by a tree, and she picks her up and drags her home with her and then the two of them get into a fight. This sort of thing happens to me and my siblings all the time. I have never had to drag my sister home from a party before, but I know exactly that feeling of being so angry at a sibling, and then the concern if something happens that distresses said sibling, and then once you know sibling is fine, you get into a big fight that you pretend never happened the next morning. I also think Brunt did wonderfully in making June's parents out to be real people, too. I am almost 30 years old and I think I am really just beginning to understand that my parents are people who are not only defined by their relationship with their children. They have relationships with each other, with their own siblings and extended family, with their friends and everyone else in the world. And they have flaws and make mistakes and can say hurtful things. I loved the way Brunt showed June's parents as vulnerable, her mother especially. June's mother was a brilliant artist in her youth, too, and wanted to be an art team with her brother Finn, but he took off to explore the world and left her behind and instead she became an accountant and a mother. And I think so many parents must feel that - not always resentment, not always wistfulness, but this sense that there is this whole other life out there that they could have led but did not. But really, June made this book for me. She's the sort of girl who buys massive boots at the Renaissance Faire and then wanders around the woods in the dead of winter wearing a dress, pretending she's a girl living in the Middle Ages. Honestly, as soon as I read that, I fell head over heels in love with June. I love that Brunt wrote a character like that because it makes all my own daydreaming about living in more romantic and interesting time periods seem totally normal. She was such an engaging narrator, not just because she wishes she lived five centuries ago but because she observes people and notices things and tries to know herself. Thanks to Jenny for her beautiful review of this book that put it on my radar. I've been wondering about this one. And I'm so glad you included that example of June at the party because I can so relate too!! You really made this book sound like something I'd really like. I have heard a lot of good things about this book, and what you've said entices me even further to read it and discover the magic that lies between the covers for myself. It does sound like this is one that I would love, and it seems to me from reading your review that there is a timeless quality to the book, as well as a romantic approach to the writing. I am so glad that you loved this one, and that you gave it such high marks. I think this will be a gift for myself this Christmas!! This looks amazing. I don't think I would have necessarily picked up this book but your post makes me curious now! I saw a brief mention of this and placed a hold on it at the library without knowing much about the story so good to learn a bit more and know you loved it. June sounds a wonderful character and I look forward to reading it. What a beautiful review. I love books about family and am also interested in how family members view each other. I was in my early twenties when I started to think about my parents as people just like me but now that I have a son of my own I think about that stuff even more. I hope that there is a way I can raise him so that he understands that we are all people, all the same, early on. And I love how June wants to live in a different time. I went through a whole medieval phase and it's nice to know that others go through similar things. I'm thrilled you liked this! I just loved it so, so much. I like it more and more the more I think about it, and I want to reread it next time I'm home. It is maaaaaaybe my favorite new book of 2012. Exactly what you liked is true! The way it portrayed family was so nuanced and true and awesome. And the ending was perfect. I can't wait for this author to write moar books. What a wonderful post, Aarti! This book made it to my Pinterest board of cool book covers even before I started to realize it was a popular one among book bloggers. It's top priority in my wish-list. "I love that Brunt wrote a character like that because it makes all my own daydreaming about living in more romantic and interesting time periods seem totally normal." Seriously? In which case I've got to read this book! Thanks for a great review. I read this book on a whim and with some trepidation--I thought it might be too sentimental. Not at all! It was a wonderful, well written novel with great characters, easily one of the most engaging books I read this year. Like you, I loved June and thought the depiction of family relationships was right on. This author is definitely on my radar---I'll almost automatically look at anything she does as a second act. I just got this book yesterday from Chris! I am really looking forward to reading it!! This was one of my favourite reads last year so it is great to see you enjoyed it. I ended the novel feeling as though I knew the characters and agree with you about their future. :-) I can't wait to see what she writes next!